Wow, my son is really fast on this bike. If you had asked me before he got this bike whether a bike could make a difference in how fast kids can ride, I would have absolutely have said no way. Well, I’m now a believer and the difference is frame geometry, not weight. NOTE on Comparing Star Ratings between Interbike 2014 and 2015 bike tests: I’ve found already that the new bike designs I’m riding this year are a step better than the best bikes I rode last year. What was a 5 star rating last year would only be a 4 star rating this year. The core feature of the Trigger is a proprietary Fox-designed shock that allows the bike to be adjusted to either a short-travel 85mm mode or a long travel 140mm mode. The Trigger had a pleasingly snappy climbing feel on smooth surface, but rougher terrain tended to throw it off-line easily. Rocky climbs tended to throw the Trigger off-balance and off-line. Despite having a 140mm long-travel mode, the Trigger has the personality of a short travel XC bike. Lack of compliance in the front shock and rear suspension requires a good amount of attention to keep the Trigger in line. The Trigger is fast cornering, but lack of compliance in its suspension require attention when traversing rough terrain. I tried both the short and long travel modes. I quickly defaulted to using the long travel mode since the short travel mode didn’t necessarily feel much more efficient. The personality of the Trigger is definitely more XC-oriented even in the long travel mode. The Repack is a good first effort by Breezer bikes to build their first longer-travel bike, but doesn’t yet have the stability and suspension compliance that might be expected from a bike with this much suspension travel. The Repack climbed well on roads and smooth trails, but its climbing stability was thrown off by rocks and terrain features reducing its ability to use its suspension to climb rougher trails. Descending performance was okay. With a design oriented around faster steering, the Repack has more of a XC bike feel and is less composed descending rough trails. Again, the fast steering tended to get thrown off by mid-corner rocks and other obstacles. This is a long travel bike with the personality of a fast rolling 29er. Lack of compliance in its rear suspension system reduced its ability to use that suspension to its advantage in rough terrain. The Spartan actually was a decent climbing bike with a solid feeling under hard pedaling. Where it falls short is that the Spartan is just not a fast climber due to its weight. The Spartan is an extremely stable and solid-feeling descender. It was one of the best bikes I tested in the last several days for maintaining direction and not getting knocked off course by rocks. The Spartan’s cornering is extremely predictable, but it lacks the last degree of nimbleness that the best bikes in the category (Turner RFX, Santa Cruz Bronson) now have. This is a bike to consider if you are looking for one bike that can be used for bike park riding as well as for trail riding. If you're mainly going to be doing trail riding, the DeVinci Troy might offer a better balance between climbing ability and descending capability. 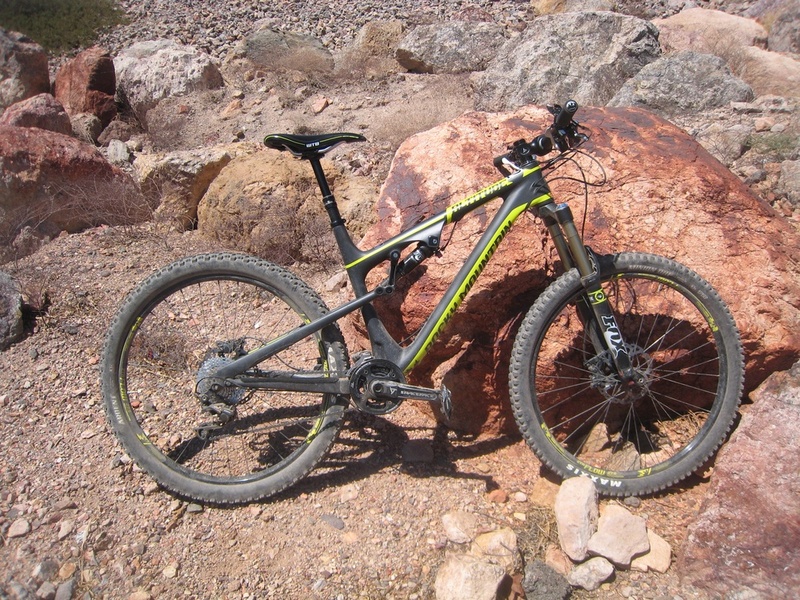 Our review of the Troy from Interbike 2014 is located at: Dirt Merchant Bikes' DeVinci Troy review. Climbing performance was solid though the Mach 6’s climbing efficiency was balanced with downhill stability. The Mach 6 had less of a connected feeling between the pedals and the rear tire than the Turner RFX and the Bronson. The slack head angle caused some wheel flop in tight turns. The slower steering required more deliberate steering inputs than other faster steering bikes. With geometry oriented toward descending, the Mach 6 gives up some climbing efficiency and nimbleness in its handling. Wow, riding this bike was a revelation. At 5’9” in height, I’m not usually the best candidate for a 29er, but riding the Mach 429 opened my eyes to what can be done to create an exceptionally capable, all-around trail bike with 29 inch wheels. I expected that the Mach 429 with 29 inch wheels would climb well. What was a surprise was how solid it felt going downhill. The handling hit the ideal balance between nimbleness and stability just right. The Mach 429 remained stable at speed and down chutes and drop-offs. The Mach 429 was both responsive and stable in cornering. The only downside that I found for the 429 was steering that might not be quick enough for tighter trails. 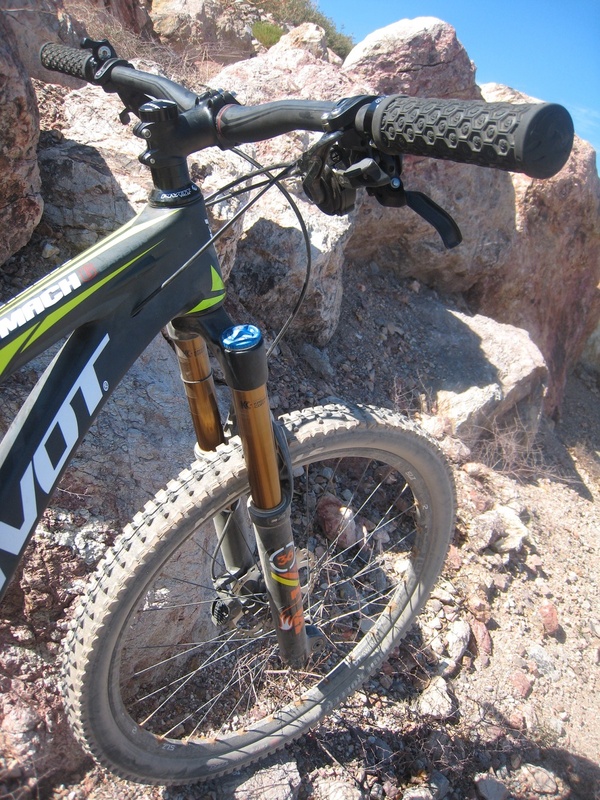 For the Bootleg Canyon trails used for Outdoor Demo at Interbike though, the Mach 429 steering was right on the mark. For trails that are not overly tight, the Mach 429 Trail is a great choice. It climbs well, holds its line, and rolls over stuff like a 150mm travel 27.5 wheeled bike. It is definitely a bike that would be a top choice for me if my usual rides occurred on trails similar to those that I rode today at Outdoor Demo. This bike had a mind of its own, but unfortunately the thoughts it was thinking were not the same as what I had in mind. I felt really tall and tippy and not at all confident on this bike. With a design similar to the dw-link, the Maestro suspension design climbed well on the road going up to the trail and other smooth surfaces. 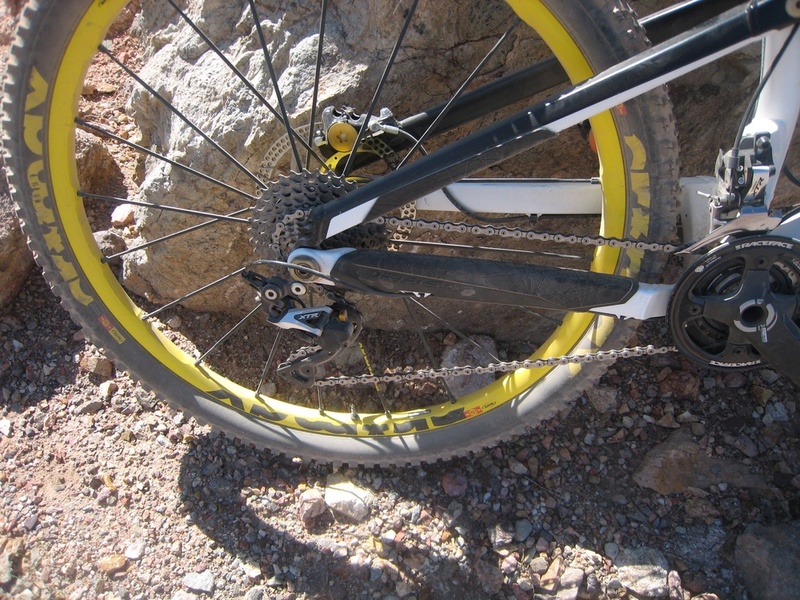 On the trail, the relatively non-compliant suspension became much less effective as it was easily thrown off by rocks and other terrain features. The suspension actually seemed to hinder, not help in technical climbing situations. This was a really nervous feeling bike. Even on flat trails, I felt that I needed to be very vigilant when riding this bike. The bike did not hold a line well and was easily bucked into unexpected new directions. The steering feel of the Trance lacked predictability and controllability. It wasn’t just because it was quick steering. The bike overall felt like a short travel XC design with 140mm of suspension travel bolted on. I had difficulty riding this bike even on easy terrain. Giant bikes are certainly great values considering the component spec, but I would highly suggest that you do an off-road demo of a Giant Trance before buying one. The Specialized Enduro rides very much as you might expect a modern enduro bike to ride. Cornering on the Enduro was stable & predictable but a bit slow to react. I had ridden the original carbon Bronson, but wasn’t impressed with its climbing abilities. Based on early reports on the new Bronson though, the changes to its VPP suspension geometry seemed promising. Climbing performance of the revised Bronson is really good with performance lacking perhaps only in comparison with dw-link designs that feel like they provide a more direct connection between the pedals and the rear wheel. Climbing performance of the revised VPP suspension is better than just about all of the Horst Link designs that I’ve ridden (e.g. Specialized FSR) that require more compression damping on the rear shock to manage the active nature of the Horst Link design. The Bronson felt great going downhill. It seemed to settle into its suspension travel even better than the prior version of the Bronson for which descending was a strength. The handling characteristics provide a good blend of stability and quickness. The only area in which I thought the Bronson could be improved is that its frame is not quite as stiff as that on the RFX so the Bronson felt a little less rock solid in choppy terrain or in off-camber corners. Steering on the Bronson felt both stable and predictable. Like the RFX, I wouldn’t characterize the handling as either fast or slow but rather as having the right balance between quickness and stability. I really liked the feel of the revised Santa Cruz Bronson. Some bikes feel alive and responsive, while others do not regardless of whether they have geometry that fits the current trends. The Bronson is one of those bikes that felt both fun to ride and willing to allow its rider to push it harder. Dirt Merchant Bikes has medium, large & X-large RFX bikes available for demo in the Seattle area. or contact us at jeff@dirtmerchantbikes.com for more information. Turner’s implementation of the dw-link in their bikes provides a feeling that the pedals are directly coupled to the rear wheel in a way not dissimilar to how a hardtail feels when climbing. Hammering on the RFX, creates instant forward motion without rear suspension movement softening the directness of that connection. The main difference between how the RFX climbs versus a hardtail is the 160mm of always active rear suspension that digs in on loose, technical climbs. Some riders will state that suspension performance for climbing doesn’t matter because they can always lock out a rear shock, but the RFX’s dw-link suspension allows rear shocks to run with minimal compression damping providing better traction on loose, technical climbs. So the RFX provides an exceptionally high degree of climbing efficiency together with the advantage of a fully active rear shock maximizing the amount of available tire traction. The RFX has climbing abilities at least equal to the Burner that has 20mm less suspension travel. The Burner itself is no slouch at climbing with several of my testers participating in our tire tests commenting that it climbed better than their shorter travel bikes. I am unable to make a more direct comparison between the climbing capabilities of the RFX vs the Burner as my experience with the Burner in our demo fleet is with Enve M60 wheels and 2.25 Schwalbe tires while the RFX I rode today has M70 wheels and 2.35 Schwalbe tires that add a bit of rotating weight. As well as the RFX climbs, it is far from one-dimensional in its strengths. The RFX settles well into its suspension travel and is intuitive feeling on descents providing the rider with great control to make small handling adjustments with body movements or braking. Compared to other dw-link bikes, Turner’s implementation provides the climbing ability that the dw-link suspension design is known for with no compromise to descending stability. The RFX has a head angle and frame geometry that provides steering that is neither too fast nor too slow. The head tube angle is precisely balanced between enough slackness to provide the right amount of downhill stability while being steep enough to eliminate wheel flop on tight corners. I got in over my head on a dropoff, but I never felt like I lost control of where I wanted to go with the RFX. Being intuitive in its handling allowed me to feel confident in pushing the limits of my riding abilities. In addition, though the RFX I tested weighs 26 lbs with a heavy SRAM GX component group and Enve M70 wheels (which are stiff but not particularly weight saving), it was designed with an eye towards frame stiffness. The stiffness of the RFX frame shows in how the RFX is able to plow through rocks and higher-g corners with no wavering in the rider’s selected line. What was really special to me about the RFX was that it provides a level of downhill stability substantially greater than the Burner while losing none of the Burner’s handling agility. Again, the RFX is not the fastest steering bike available, but rather strikes a balance between nimbleness and predictability in its steering. Adjusting cornering lines mid-turn requires only minimal body movement and steering. The RFX corners like a faster steering, shorter travel bike with the mid-turn stability of a big travel bike. This is a one-quiver bike that I would choose to ride for all types of trail conditions in the Pacific Northwest. Typically, our trail conditions provide good grip so it’s fairly easy to get into higher-g cornering for which the stiffness of longer-travel bikes is helpful in resisting side loading forces. At the same time, the RFX steers fast enough that it doesn’t give up much in nimbleness to shorter travel bikes while providing an exceptionally intuitive level of downhill control. If this sounds like a superlative review, it is indeed intended to convey the unique balance of strengths that the new Turner RFX offers. But, don’t just accept our opinions on the new RFX. We invite you to try out the RFX for yourself to see if it is a good fit for your riding style and preferences. Dirt Merchant Bikes expect to have our RFX bikes available for demo in the Seattle area around mid-October and are considering also having RFX demo bikes available for monthly demo sessions around the SF Bay Area. Feel free to contact us at jeff@dirtmerchantbikes.com for more details on RFX demos. Dave Turner provides the background on the development of the new Turner RFX v4.0 carbon enduro bike and describe the details that help the bike ride well. The marketers have already won over many of us that carbon fiber must be the better material for bike frames. But...how many of you have actually tested this assumption. The benefits of carbon fiber are undeniable in theory. Carbon fiber offers the same strength as an aluminum bike at less weight. Carbon fiber offers, at least in theory, more tunable ride characteristics. I did a subjective test at the Interbike Dirt Demo of how carbon fiber suspension bike frames feel versus aluminum frames. I rode several bikes that were similar in intent and suspension travel. The first test subject was the Specialized Stumpjumper EVO in carbon which honestly did not feel great at either climbing or descending. I also had a chance to ride both the Devinci Troy in both carbon and aluminum back-to-back. As I expected, the aluminum Troy felt more sluggish than the carbon Troy. Case closed, right? Not so fast. The last bike of the day was the Transition Patrol in aluminum. Carbon fiber or no carbon fiber, the aluminum Transition Patrol was one of the best riding and best feeling bikes that I rode at Dirt Demo. 1. You can't generalize as to how carbon or aluminum will feel. Geometry and ride tuning are factors that will likely be more important than frame material in affecting how a bike rides. 2. I need to spend two days at Dirt Demo to answer any questions that come up for me on the first day & answer any questions/requests from all of you! Thoughts on carbon vs aluminum? Kevin from Transition Bikes presenting their new bikes for 2015. I am really conflicted about Pivot bikes. Having owned a Titus Switchblade, I really want to like any bike that Chris Cocalis creates with Pivot. That said, I have never fully felt comfortable on a Pivot bike and the Mach 6 is no exception. With a focus on descending and heavier weight than many of the other bikes tested today, the Mach 6 was a solid climber, but by no means the best. The Mach 6's additional weight no doubt affects it climbing performance. At least the Mach 6 is consistent in its performance. Descending feel was super solid and predictable, yet still fun. The Mach 6 is steady and predictable in cornering, if lacking a bit in liveliness. Summary: The Mach 6 is a great descending bike at the expense of some climbing ability. It's baby brother, the Mach 5.7, is a super climber, but doesn't feel completely settled going downhill. Combining the best of these two bikes in one bike would make a killer bike, but other bikes that I rode today (namely the Devinci Troy and the Transition Patrol) actually get close to this ideal. Dw-link suspension has an initial rearward travel to reduce suspension squatting. Even at 5 pounds heavier than many of the other bikes I rode today, the Rallon was not a bad climber. The Rallon was a better climber than the Stumperjumper Evo 27.5 which I had maligned in an earlier review. I give the Rallon 5+ stars because it really is in a totally different league for descending than the other bikes I tested. When the trail turns downhill, the Ralllon comes alive and feels super confident in a way that none of the other bikes I rode today could match. Cornering on the Rallon could not be described as nimble, but it was super solid in feel. Summary: The Rallon is a great bike for those willing to compromise climbing performance for a rock-solid descending feel. Wow, I love this bike. It climbs well and feels both nimble and stable at the same time going downhill. It rides like a BMX bike with 140mm of travel. The Troy uses a Dave Weagle designed Split Pivot rear suspension design to minimize suspension feedback affecting pedaling and braking. 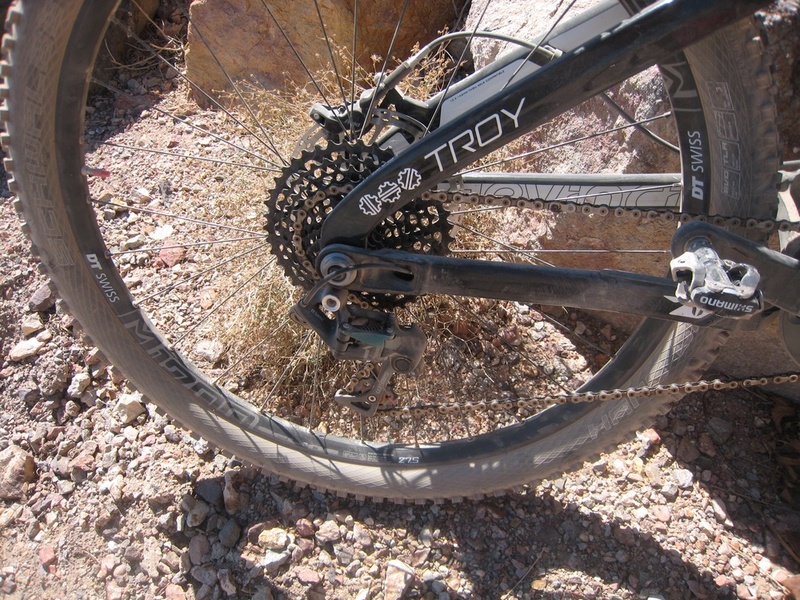 The Troy was able to feel both responsive and planted when descending. The feeling of the Troy was really confidence-building while remaining fun to ride. The Troy had a lively, responsive feel that was super fun to ride in corners. Summary: Being lively and predictable is not mutually exclusive. In many ways, riding this bike was my main event for today's bike demo event. In terms of specs, it is almost a direct match to the Turner Burner (140mm rear travel) bikes in my demo fleet. Also, with the number of Specialized dealers in the Seattle area, the is going to be the bike most commonly compared to the Turner Burner. As this is what I see as the main competition to my demo bikes, I'm sure you won't be surprised to hear that I really didn't like the Stumpjumper Evo at all, but hear me out. These are the specifics on what I didn't like about this bike. Also, when reading my comments on climbing, keep in mind that I rode this bike after my legs were warmed up, but still fresh. I can really say why, but climbing on this bike felt super sluggish like it had a loaded diaper. Other bikes with similar rear suspension designs (Transition Patrol, Rocky Mountain Altitude) felt so much better climbing that I have to attribute the Specialized's poor climbing performance to something other than suspension design. Shock selection/tuning, frame geometry, bottom bracket height may all play a part. For 2014, I do know they repurposed a 29er front triangle for their 27.5" wheel bike. I am not sure if this is why this bike still does not feel good. As dull as the Specialized felt climbing, it was the complete opposite when descending and not in a good way. I never got comfortable on this bike and was generally unsure of how it would react in different situations. Although the Specialized felt nervous going downhill, it also felt big going around corners. I thought this might be due to its 800mm wide handlebars, but other bikes that I rode later in the day had similarly wide bars and still felt agile in their handling. Handling was not at all intuitive and required a lot of focus to make sure the bike went in the desired and intended direction. Summary: What was real odd to me about the Stumpjumper Evo was that this bike had conflicting ride and handling characteristics that were completely wrong for each aspect of its performance. I was fighting this bike for the entire 20 minutes that I rode it. Specialized still uses a fairly traditional implementation of the Horst Link which relies on shock damping to control rear suspension movement. This was a good first bike to ride for the day as it was a solid bike all around. I would be really happy to have the Altitude as my personal ride. The Altitude uses a modified Horst Link design (pivot in front of the rear wheel axle on the chainstay) with the axle dropped below the chainstay pivot to reduce the amount of bobbing when pedaling. A key feature of the Altitude is the Ride-9 feature which allows adjustment of the bike’s geometry and shock rate. By moving the position of the rear shock, the head angle can vary from 66.6 degrees to 68.3 degrees and the seat angle between 73.6 degrees and 75.3 degrees. The bottom bracket also raises or lowers by 10 degrees. These adjustments can also vary the amount of leverage on the rear shock to better adapt to lighter and heavier riders. The Altitude pedaled well, but didn't feel super snappy when laying down the power. Descending was solid and predictable. The only thing the Altitude really lacked was a bit of immediacy in its steering and liveliness in its feel that the best bikes have. Not exceptional in how it felt cornering, but completely predictable in feel. 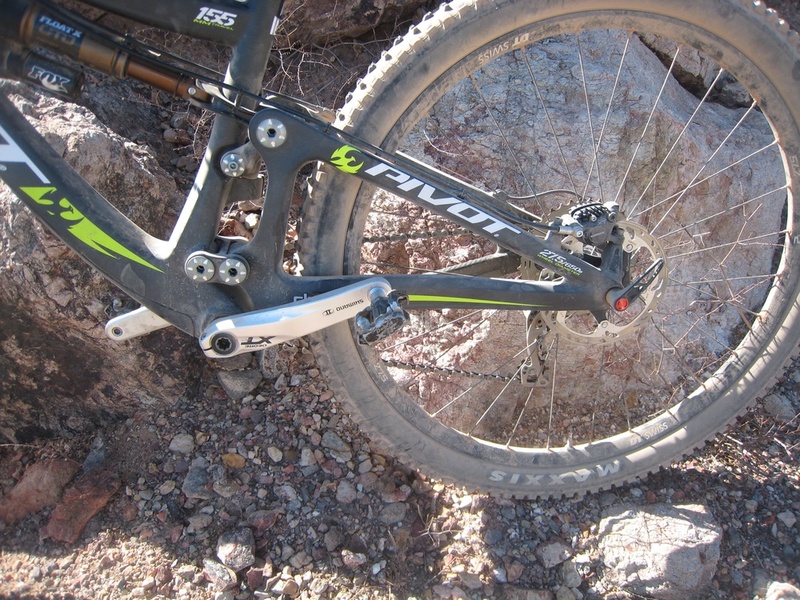 Rear axle is dropped below chainstay pivot for better climbing performance. Dirt Merchant Bikes is the exclusive Seattle & Tacoma area dealer for Turner Suspension Bikes and Cleary Bikes for kids. Dirt Merchant Bikes provides mountain bike demos at Duthie Hill Mountain Bike Park in Issaquah, WA.